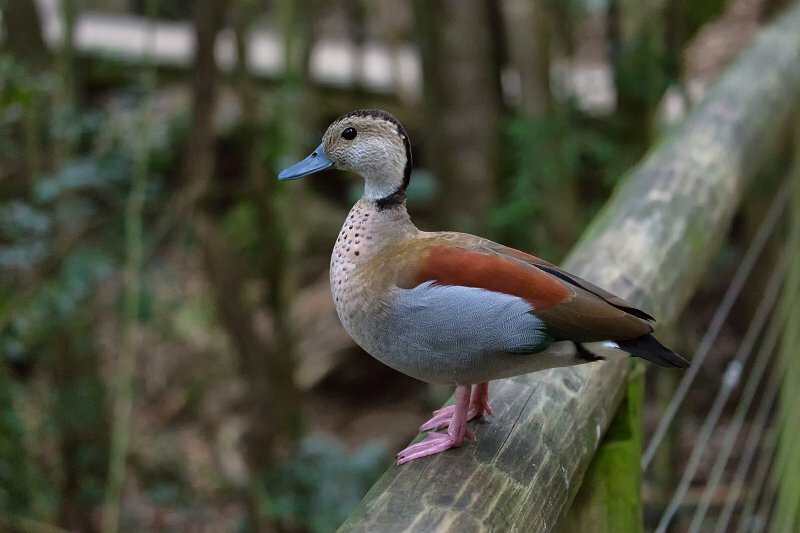 The ringed teal (Callonetta leucophrys) is a small duck of South American forests. The male and female remain colourful throughout the year, lacking an eclipse plumage. The drake has a rich chestnut back, pale grey flanks and a salmon-coloured breast speckled in black. A black band runs from the top of its head down to the nape. Females have an olive-brownish back with the head blotched and striated in white, with pencilled barring on a pale chest and belly. Both have a dark tail, a contrasting pale rump, and a distinctive white patch on the wing. Bills are grey and legs and feet are pink in both sexes.